I haven't been a very consistent blogger lately--in my defense, it hasn't been as bad as the infrequency of my journal writing, but still, I'd like to be more consistent. Part of the reason for my inconsistency is that we have had a crazy busy summer. In particular, we have had tons of family (quantity, not weight) coming through town to stay with us. For example, this past week we babysat/hung out with the four kids of Diane's brother Ben and his wife Sarah, because they were in Hawaii or something. Well, this morning when Ben and Sarah got back from Hawaii or something, they gave me a rad thank you gift. It's so rad, in fact, that I had to break out of my blogger slumber just to write exclusively about it. 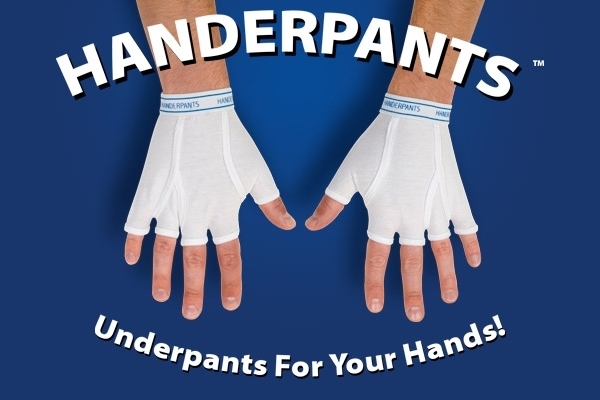 Behold: handerpants. For times when underpants just aren't enough. Taking my handerpants for their first test drive. I'll never blog without them again. including construction, cooking, and of course, "the elderly".